“On a night in which we honor so many deserving people in the community, it’s wonderful to see our Village staff and elected officials earn the praise they deserve,” said Mayor Ron Gunter. 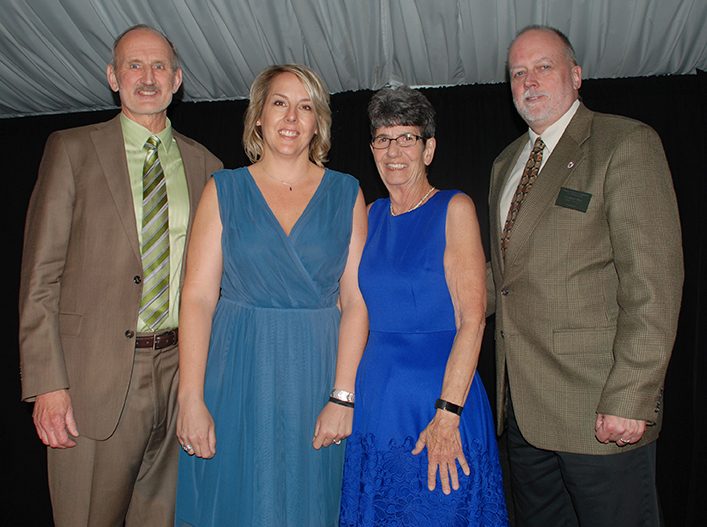 “I want to congratulate all of the award recipients.” At the annual Westmont Community Awards Dinner on April 20 at the Hilton Chicago/Oak Brook Hills Resort, several special awards were presented to members of the Village municipal organization. Mayor Gunter surprised Village Clerk Virginia “Jinny” Szymski by presenting her with a special Mayor’s Appreciation Award. Mayor Gunter shared Jinny’s long list of accomplishments with the audience including the fact that she has been Village Clerk for the past 20 years and was recently re-elected to serve another four years. In addition to being involved with her church, Westmont Rotary, Westmont Lions, Westmont Special Events, the Chamber of Commerce, and more, Jinny has also served as the President of the Municipal Clerks of DuPage. And last year, she was recognized for her many great accomplishments when she received the 2016 Illinois Clerk of the Year Award presented by the Municipal Clerks of Illinois. Jinny also received the Westmont Special Events Making Memories Award which is given to a citizen who understands the importance of community events and bringing people together to build positive relationships. Westmont Special Events has recently renamed their annual award, which will now be titled the Jim Wright Making Memories Award in honor and appreciation of Jim who has given many years of unyielding support for community events and the Village of Westmont. Mayor Gunter also presented the 2016 Public Service Award to Jenny Babyar. This annual award is given to a Village of Westmont employee who has demonstrated exceptional customer service throughout the year. Mayor Gunter shared with the audience that Jenny has received numerous compliments and customer service award nominations for her positive attitude, friendliness, and helpfulness. Jenny works with both the Village Business Office and Communications Department, and in those capacities, has been involved with the Village’s new Sister City Program and the current community branding initiative. Jenny is also very involved with community events such as the Red, White and BBQ Festival and Westmont Cruisin’ Nights. Additionally, the Chamber of Commerce presented its annual Public Safety Award to Westmont Police Sergeant Mike Weibler. Weibler has been actively involved in the community in numerous ways including his service as the School Resource Officer for Community Unit School District 201 and the Maercker School District. Recently promoted to Sergeant, Weibler’s current assignment is patrol shift supervisor as well as the range master for the Police Department. Mike is known for his friendly, upbeat and approachable disposition. The Village of Westmont congratulates and thanks Jinny, Jenny and Mike for their outstanding service to the community.